The best kept secret in pop/rock compilations is Universal Music Netherlands’ occasional ‘Collected’ career summaries. These continue in August with a three CD Huey Lewis and the News set (and a 2LP vinyl). Perhaps because these are never full international releases (and normally have to be bought as imports) the label has a knack of licensing the tracks that more mainstream compilations normally forego (songs from soundtracks, various artists compilations) and this set looks typically superb. It goes right back to the beginning by including the A and B-side of the band’s first single in 1979 when they were called ‘American Express’ (on CD 3, the disc normally reserved for rarities) and brings the story right up to date with a couple of tracks from their last studio outing, 2010’s Soulsville. In between (on CD 1 & 2) is no less than every single the band every released, often in single edit form – for example the rare Jellybean single mix of Back in Time is included. The third disc mops up plenty of rarities including a couple of tracks by US country/rock band Clover (when Huey Lewis was a member), the live Trouble In Paradise from the USA for Africa album, B-side Flip Flop & Fly, the band’s cover of Oh! Darling from the 1995 compilation album Come Together: America Salutes The Beatles and four extended versions that the label are claiming ‘unreleased-on-CD’. They are the Extended Version/Dance Mix of I Want A New Drug (the song that famously ‘inspired’ the Ghostbusters theme tune, the Jellybean Remix of both Heart and Soul and The Power Of Love and the Dance Remix of Hip To Be Square. This is all good stuff and vinyl fans can pre-order a 2LP gatefold vinyl edition that has a cut-down version of the 3CD track listing; even better, snap up the limited RED vinyl (1,500 copies) at a great price (see below). 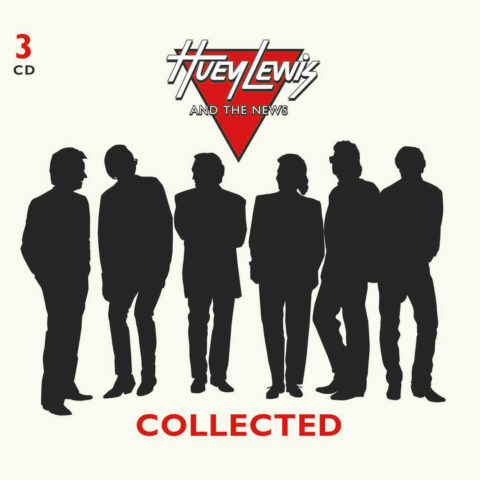 The 3CD of Collected is released on 1 September 2017, and the vinyl follows a week later on 8 September. I pre-ordered this from Amazon.com, hoping it would ship on the day of release (Sept. 1), but it hasn’t shipped yet. Has this happened to anyone else who pre-ordered? Just wondering. Can´t find the CD version on Amazon, only the vinyl set.. According to Amazon this is being released tomorrow ? Just bought this from the marketplace on amazon and it’s preparing for dispatch. Only thing the estimated delivery is the the 4th September hope it comes a lot quicker. I’ve never owned any Huey Lewis music before, but looking through the song list; I see so many songs that I recognize. I think this might be worth a blind buy! PS: The version is not mentioned on the sleeve of the single. The difference can be seen in the lenght (3:53 for the album version, 4:18 for the remix). the version of Power of Love with the extended guitar solo is also known as the Jellybean Single Remix. It has the same enhanced drum sound and sound effects plus more echo on the vocals, just like the 12″ Version. It has been released on single in the UK in 1986 to promote the Fore Album. The CD is on Amazon now priced at £20.46 and the release date is the 1st September. I am glad to see the Gwyneth Paltrow duet is left off! Yeah! Hey RichardB! That is very interesting indeed. Yeah, it looks very much like this 8-CD set does have the PoL version with the extended guitar solo. Plus, I just realized in fact, that extended guitar solo version was on the first German pressing of the Fore! CD, so it actually can be found on a Huey Lewis CD as well. AudioDile, oh man, that would be great if it was indeed the 6:42 “Special Remix”! I have it on the German 12″ you mention and I think both the 5:49 remix (which is on the Japanese “Super Selections” CD) and the 6:42 one are great in their own right. Fingers crossed they picked the 6:42 one for this release. Well, bummer. It’s just the same old Heart & Soul remix we’ve already seen released on CD. I guess I’m spending $25 for one remix of Hip to Be Square then, LOL. 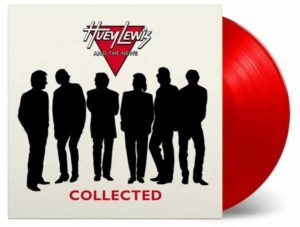 According to The Second Disc website, in the footnotes of the tracklisting, it suggests that the Heart & Soul remix is in fact the Special Remix (6:42) taken from this German 12″: https://www.discogs.com/Huey-Lewis-And-The-News-Heart-And-Soul/release/1242354 – it was also released on some versions of the New Drug 12″. As for the “Jellybean Remix” tag, I can’t find any real confirmation which of the two remixes is the Jellybean mix, the one that’s been released on disc or the “Special Remix”. Hopefully it’s the 6:42 version and not the 5:49, which would make this even better. Did the UB40 Collected album feature single versions? Very awesome collection! I’m glad to see a lot of stuff that I’ve been keeping around on vinyl for many years, especially the American Express tracks. Plus a bunch of live B-Sides. No matter what, this collection is dynamite! I am looking forward to it. Nice to see the single mix of Back In Time included. But it would have been nice to see the extended version as well. I Want A New Drug (Dance Mix) is on So80s 10 as well. Looking on JPC they are asking £20 for this i think i will wait until it appears on Amazon like the Robert Palmer one did which i picked up for £12. is it true that the jellybean remix of ‘the power of love’ (7:10 minutes) is unreleased on CD? That mix is on that Japanese compilation i linked to above. I have always wished they would have brought out deluxe versions of their albums especially Sports,Fore and Small World. I know they did Sports a few years back but it was rubbish. Saw Huey and the News live when they had just released the Small World album. Great live and been following them since. Must buy for the CD set. BATEMAN: Their early work was a little too new wave for my taste. But when “Sports” came out in ’83, I think they really came into their own, commercially and artistically. The whole album has a clear, crisp sound, and a new sheen of consummate professionalism that really gives the songs a big boost. He’s been compared to Elvis Costello, but I think Huey has a far more bitter, cynical sense of humor. ALLEN: Why are there copies of the Style section all over the place? Do you… Do you have a dog? A little chow or something? ALLEN: Is that a raincoat? BATEMAN: Yes, it is. In ’87, Huey released this; “Fore!”, their most accomplished album. I think their undisputed masterpiece is “Hip To Be Square”. A song so catchy, most people probably don’t listen to the lyrics. But they should, because it’s not just about the pleasures of conformity and the importance of trends. It’s also a personal statement about the band itself. Hey, Paul! There are further chapters about Whitney Houston and Phil Collins. RJS – I may be forced to read now. Thank you! Sehr schöne Zusammenstellung und das für nur 17 Euro bei JPC, Danke für den Hinweis! Only on some Japanese compilation still means that they are reasonably rare though (albeit not ‘previously unreleased’ as claimed). The mullets still look awesome even in silhouette. There was a super hits Japanese import that had all of the 12″ remixes on it with the exception of the remix for “hip to be square”. I ordered it years ago used on Amazon. I’m not sure if it’s still in print? What other bands have been released under the Collected range? If you go to the Music on Vinyl website they have a full list if you search for “Collected”. I have UB40, Marvin Gaye, Thin Lizzy and Robert Palmer and they are superb. I missed out on Mamas and Papas, Charles Aznavour etc as the material didn’t excite me but the next tranche sounds better. the one I can’t seem to find on Vinyl is Paul Carrack which also looks terrific. I believe Clover were the backing band on Elvis Costello’s debut album? Fantastic. If only they would do one for Hall and Oates! There’s a wonderful box set for Hall & oats that covers all of the rarities and there’s also a greatest hits collection that includes all of the single 7 inch mixes along with the video remix for “out of touch”. Universal Netherlands releases many interesting compilations. The reason I haven’t been buying them for years now, is because of the sound quality. Often they use vinyl drops for tracks that have not been released on cd before. Tracks that have already been on cd, they take from the previously released cd’s instead of using the masters. Then they ‘level’ the bunch. So, if tracks have already been leveled before, for an earlier cd, they are being leveled again. Not a good thing. My local independent, Banquet Records in Kingston, are stocking the red vinyl for £23.99! I wasn’t impressed by the sound on the Level 42 “Collected”-CDs. Hope this one’s better – cause I love the tracklisting! Amazon UK has a listing, but only black vinyl version so far. Saw this on Huey Lewis’s site the other day (I’m a secret fan of theirs lol!) and was very happy to see this set being released! It’ll be nice to own the American Express singles finally and some rare tracks. It did say on their website this will be available worldwide soon. These Collected series are great – if only the guys that compile these could compile a Peter Gabriel and Phil Collins set with non-CD B sides and 12″ mixes…. A Eurythmics Collected that rounded up some of the many, many tracks that were left off the reissue series would be great. I think most of Collins’ stuff have been released on this recent [but crappy-ish releases] except for the 12″ers and live stuff. Nice! Not sure I ever got the New Drug/Ghostbusters thing, but then I am not a musician. There has been talk of a new HL&TN album for a while, I still cannot see any sign of it. Never heard Exo-Disco or Clover so I will be getting this one. The synth basslines and synth chord stabs are *very* close, albeit in different keys. Anyway, RPJ settled out of court so he either didn’t think he had a case, or he just wanted the suit to go away. Looks like a pretty good set. Definitely on my radar. Surprised, since there are some solo tracks on here, that they didn’t license “Cruising” with Gwyneth Paltrow from the Duets soundtrack, since that actually had some chart impact, but I think is harder to find right now. nice to see mov trying to squeeze nearly 25 minutes of music onto a side of vinyl. recently got the extreme reissue and its awful a complete lack of bass and the ub40 collected sounds great at the start but is easily a track too long on each side. I bought “Sports” “Picture This” and “Fore!” LPs off Discogs for about £4 each. Its awash with them, and in great condition too. Still sounds fantastic.